"﻿It was cool to see my teeth close-up on the TV screen. Now I understand why I needed treatment." 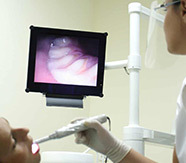 An intra-oral camera is a specially designed little camera that can take photos inside your mouth. It is very small so it is comfortable to use. No film is required because it is a digital image. 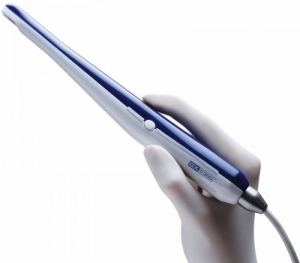 The advantage of this technology is YOU can see cracks, decay, or any abnormalities of the teeth. 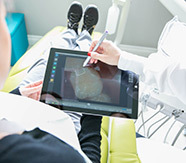 Driven by our commitment to involve our patients in their oral health decisions, our intra and extra oral cameras allow you to watch the health status of your teeth and gums and discuss the procedures required. Also gives you opportunity to see before and after images. Dr. Melissa or anyone on our team can give you a tour of your mouth. We love to educate you on the benefits of a healthy smile and this is another way to increase communication with you. The intra-oral camera makes your teeth appear 20X larger than real life and we can display this photo on one of our individual treatment monitors chair side. Therefore, we can show you close-up images of any problems we may note. Another advantage is it is easier to communicate with your insurance company or a referring dentist. This camera helps us remember how the teeth or tissue appears at a particular time so we can monitor abnormalities. In addition to the intra-oral camera we have an extra-oral digital camera that allows us to take beautiful before and after photos and full arch intra-oral photos. Please ask us to show you your teeth "close-up."